You’ve heard it said many times in polymer clay books, in tutorials, and most likely many other places that there is “no such thing as scrap clay.” But there’s a trick to gaining usable scrap clay and not just a mess of murky, brown, dirty ugliness. They were highly interested in this because many people store their clay many different ways. First, I store partially used blocks of clay in a divided beading storage bin. I have divided my clay by clay colors: red, fuchsia-esque, pinks, yellow, orange, whites, purples, blues, black, browns, specialty, greens, metallics, dark browns, and pastels. I really don’t worry about clay touching or mixing a little. Why? Because by the time it’s properly conditioned, those little tiny bits get all absorbed and blended into the clay; and in reality those tiny bits won’t change the color of your clay that much. I use primarily only one type of clay: Premo by Sculpey. You can see some clay is in “wrapping.” This is because it is Cernit, Kato, or Pardo. The Fimo is easy to tell apart from the Premo because it is “sectioned” differently than the other clays. I use my divided storage bin primarily for clay that has been “unblended” by me. It’s straight from the package clay…even if it’s little pieces! But, not to be undone, I also have a second storage system for my clay: a mini 3 ring binder. The mini 3 ring binder has a notebook in the front cover pocket, colored dividers, and clear see through insertable pages. I keep my clay inside these pages. It’s already run through the pasta machine and it’s ready to go for my next claying…all you do is take it out, fold in half, and run through the pasta machine. I do this for all my scrap clay custom blends (which you will see at below) and for all my other custom blends and color combos. TIME (From Start to Finish): Approximately 35 minutes for every 4 ounces of scrap clay. Now for the truth: How long does it take you to have little tiny bits of clay floating all over the place? Some of those little bits can be used for details on your pieces, but most likely even the tiniest of bits (especially from custom marble blends and mokume gane) end up in the “scrap pile.” I’m praying that you have one of those…if not…GET ONE! Here’s my scrap pile. This has been accumulated over approximately two months….let me tell you, there’s a LOT of clay here, it’s just hard to tell! In total what I have shown here is about 6oz. of “scrap clay” pieces, components, balls, and nubby ends (an equivalent of 3 blocks of clay). Now that you’ve done the hard part (which was getting all those tiny bits so that they were sticky and so that they weren’t hard little rocks) it’s time to condition and blend the balls of clay together. This is the easiest part, but it takes the most time. Just flatten the balls and plop them into your pasta machine and blend, blend, blend until there are NO streaks remaining. You’ll be really surprised what you get when you are “done.” In my “scrap clay” piles these are the BEAUTIFUL colors that I got. I’ll show close ups in a minute, but look at these! Before they were grungy, ugly, frightening tiny bits and lumps of clay. Now they are beautiful usable colors. Because most of my custom blends contain pearl, most of these colors have gorgeous shimmery metallic palettes to them. The brown on the bottom right had embossing powder and glitter in one of the mixes, so this blend will have a special touch when it is baked. You can also blend the darker or more single toned colors with a touch of pearl to give it pizazz and a lustre that is simply striking. But this is the point: USE YOUR SCRAP CLAY! Now the big question…”What do you do with them?” That’s the beauty of it: you can do anything you want to with it! You can use them to make custom Mokume Gane blends, design sculptures with it, make unique jewelry components, use them as a base of another newer blend, it really doesn’t matter. All you have to do is USE IT! I didn’t know to look at it this way. Good one. Next time I get a “scrap pile, I will then try this out on it. I am using a lot of the current one with a touch of yellow to make a cane. The darks and murky colors are cut up tiny and a few yellows mixed in in small pieces to look like a recycling center for road signs. This is what the cane is to somewhat look like just for fun. J.F.F. Katie I am now doing this and then I sort my colors in sections. great idea and thanks for the reminder. I just found on pinterest, glad I did. Love the tutorial on clay scraps. I love to mix most of my clay with translucent. It seems to make it tougher for jewelry and everything else! I have just come back into my clay after quite along time. I have some canes that are 2-3 years old and they still work beautifully, but I have to reduce them a little first to soften them. Come back anytime Sam! >Wow, that's incredible! Those colors look amazing! 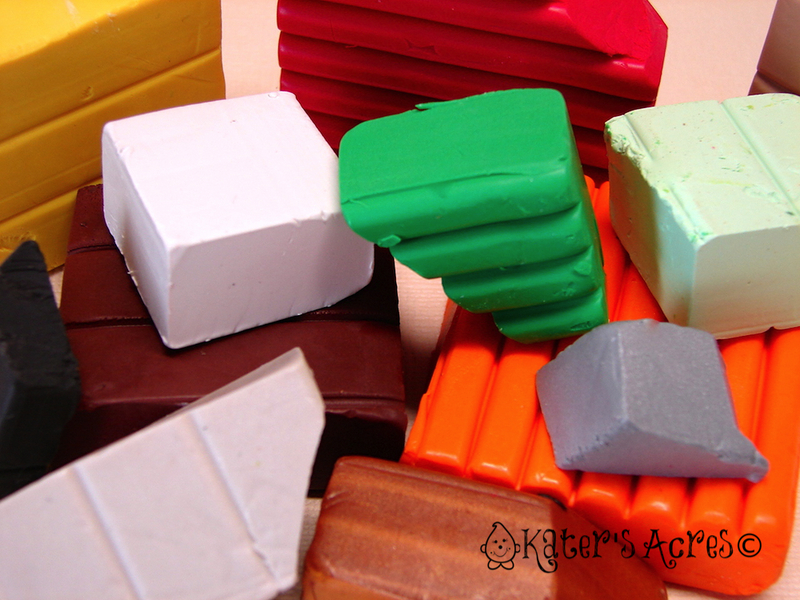 >uniquecozytreasures – What a great clay tutorial. Thanks! >Very beautiful and organized job! Katie, you are talented person. When I saw the clay I remembered a story in the bible on how God is the Potter and we are all the work of his hand. >Great ideas to reuse scraps. That clay is costly. This is a good way to recycle it. >Thanks everyone for the comments on the idea & my organizational skills too! @Robbie – Your comment on Parker's eye is HILARIOUS. His eye isn't in there, but if you look close, the CURVE on his HEAD is in there! I put a hat on him and had to chop the top of his head off. LOL! I have a 'scrap pile' for my extra canes and scraps, but I usually end up using them as a base layer for larger projects because the 'mush' is usually gray/brown. but THIS is brilliant!! >You are so creative and organized! Great post. >i think i saw parkers eye in there somewhere! very cool blog! >beautiful Katie! The blended clay looks as good as new! >You are one organized cookie ^_^! >I totally I t it!!!! !Wow, I save my glass bits, too. I have a multitude of glass scraps…takes up much more room than clay! >Thanks for this. I believe there are no such things as scraps, and waste. I have all these bits of stringing material, and chain, and single beads, that I refuse to get rid of, because that would be wasteful. but I hadn't thought to seperate and reblend my scraps. I has previously used them as the "base" of a 3D object and covered it with my "pretty color"
>i agree with crystal! i'm stunned by the amazing colors. great tutorial, thank you for sharing! >Wow, interesting how you can make something so beautifully colored from a pile of scraps!